Story: A Servant to the Cult of Ragnarok, Surtur. This Champion from the Surtur Sect believes that the world will end in a purifying inferno, which consists of using any combination of explosives, napalm strikes, or simple pyrotechnics to cause wildfires and to prompt nuclear/volcanic eruptions. Their Avatar wields a blazing sword named the Muspell, after the realm of Fire. The blade's flames are however based on an alchemical trigger, as the hilt and most of the blade contains fragments of the Philosopher Stone, and thus is a target of recovery for the Alchemist and the Agents of John Dee. Surtur, himself, is an imposing figure, as he/she is one of the tallest of the Ragnarok Avatars and with fires that are difficult to put out, make him/her a frightening sight. 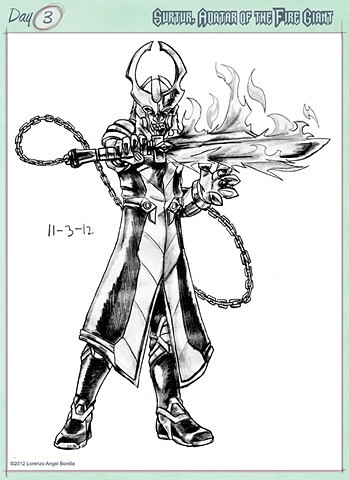 Abilities: Surtur possesses the fire sword, Muspell, and with it, shards of the Philosopher Stone. By creating friction between the air and blade to ignite fire around it, Surtur is able to manifest flames around the blade. Ignited, Surtur can project flames, cut through nearly any surface, and cast flames that perpetually on the target. As the sword is a vulnerable target for removal, Muspell's handle has a chain attached at the end that connects to a metal gauntlet on his left hand. The gauntlet, also contains a shard of the Philosopher's Stone and allows Surtur to channel flames through the gauntlet, enabling him to deliver a burning touch. Those who have survived a burning touch end with what has been called "The Mark of Surtur". Surtur is also a skilled swordsman who works in tandem with heavy sword tactics and working a specialized style of combat using the sword and chain in tandem. He/she is also powerhouse fighter, who delivers mainly brute strikes and hard grapples, indicating a possible talent in Greco Roman wrestling. Inception: Surtur was a more recent creation that spawned forth after a read of Norse myths and seeing the different beings that either deliver Ragnarok or are spawns of Loki. I modeled Surtur's helmet after a combination Talpa from Ronin Warriors and Heimdall from the Thor movie. His coat was inspired by firefighters and detailing from Kris Anka's Thor redesign. The Sword was based on the Dual Colored swords from Magic:The Gathering and the final touch of the chain connecting to a gauntlet was actually thought up today during my bus trip based on the reasons listed above.